Crash and fad diets such as the cottage cheese and fruit diet regularly come into favor with people trying to lose weight. The diet is one of the numerous variations of the three-day diet, according to the Every Diet website. If you just eat a combination of cottage cheese and fruit in an attempt to lose weight, you will be missing out on other essential nutrients. Understanding the pitfalls of a weight-loss plan involving only two food groups may cause you to think twice before embarking on the cottage cheese and fruit diet. The cottage cheese and fruit diet falls into the category of fad diet, as it requires you to consume only two types of very low-calorie foods for a specified time, does not follow generally accepted weight-loss principles and recommends extreme calorie restriction. Because you limit your diet to a single dairy product and fruits, you won't get grains, other dairy or protein, vegetables or healthy fats, all of which you need for optimal health. Of the several variations of the cottage cheese diet, the fruit and cottage cheese version requires eating cottage cheese three times each day and adding whole fruit or a cup of cut fruit each time you eat. You can choose the type of fruit you want, but the cottage cheese must stay consistent. If you eat 4 cups of fat-free cottage cheese a day, you will get 418 calories. Three pieces of whole or chopped fruit add about 250 calories, making your total calories only 668 for the day. While you will likely see a reduction in your weight over the three days you follow the cottage cheese diet, the weight you lose will likely return once you begin to eat a regular, balanced diet. If you try to follow the cottage cheese and fruit diet for more than a few days, you may begin to suffer the consequences of malnutrition, because of the inappropriately low calorie intake. When you lose weight very quickly, the weight you lose is generally water, not fat. Instead of eating only fat-free cottage cheese and fruit for a few days, use both foods in your weight-loss efforts. Cottage cheese is a low-calorie, high-protein snack or calcium-rich addition to a low-fat lasagna. Add chopped fruit to your cottage cheese in the morning for a healthy, filling breakfast. 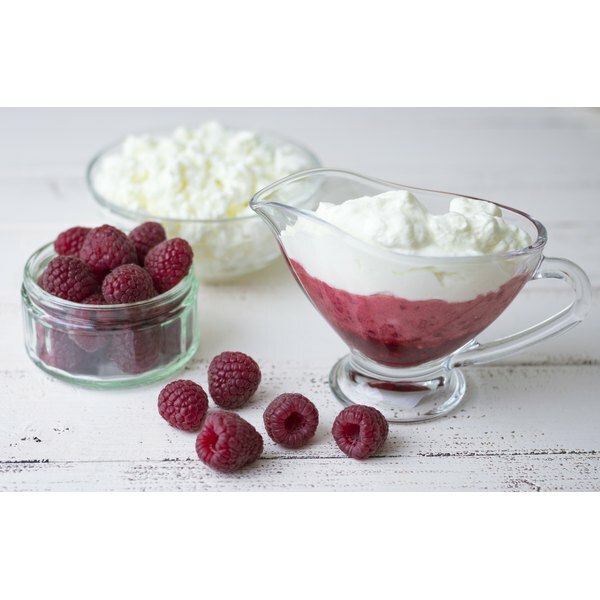 Blend the cottage cheese for dips and smoothies, or add pureed cottage cheese to yogurt.